If you’re in Hatfield, and in need of a new garage door for your home, then the team here at Bullet Garage Doors are perfect for the job. We source all of our branded garage doors from only the best suppliers, so you can always be sure that you’re purchasing a high quality product. Without extensive range of garage doors to choose from, including steel, timber, and roller styles, we’re certain you’ll find the ideal door for your requirements. We can also provide automatic doors, and install automatic systems to your existing door. All newly installed garage doors come with a standard 12 month guarantee so any problems can be dealt with efficiently. All of our services involve our customers every step of the way. From the initial survey and consultation process to the final installation, we’ll be as involved as you need us to be. If you know exactly what you’re after, then great, but we can also be a lot more informative if you need guidance. It’s not just new garage doors that we supply, we can also repair existing systems if there’s a problem. With the vast amount of experience we’ve got in dealing with garage door repairs, you can be sure that we’ll find a solution to your situation. Our reputation throughout Hatfield and the entire Bedfordshire area is outstanding, but don’t take our word for it; check out our online testimonials and Checkatrade profile, to see what our customers have had to say. We are a local business, but that doesn’t mean we’re only capable of working with customers in Dunstable. Hatfield is only a short, half-hour drive away from our location, meaning we can get to and from your property extremely easily. We’re one of the most trusted, experienced garage door companies in the area, and plenty of people can attest to that. For more information about our services in the Hatfield area, get in touch. You can give us a call on 01525 620 025 or fill out one of our online contact forms. 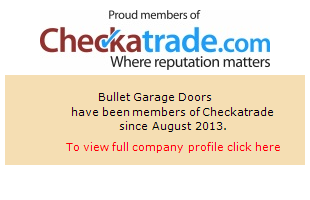 You’ll hear from a member of the Bullet Garage Doors team either way; we look forward to hearing from you.